Download "ABOUT THE FUNCTIONAL FITNESS TEST: ABOUT THE AUTHORS:"
1 The Interactive Health Partner Wellness Program addresses fall prevention with assessments and outcomes tracking in an easy to use, comprehensive online system. Website: Phone: x 121 ABOUT THE FUNCTIONAL FITNESS TEST: Although physical fitness has traditionally been associated with the young through the middle aged, it is most critical for those in their senior years. Older adults require adequate strength, flexibility, and endurance to accomplish even ordinary, everyday tasks. 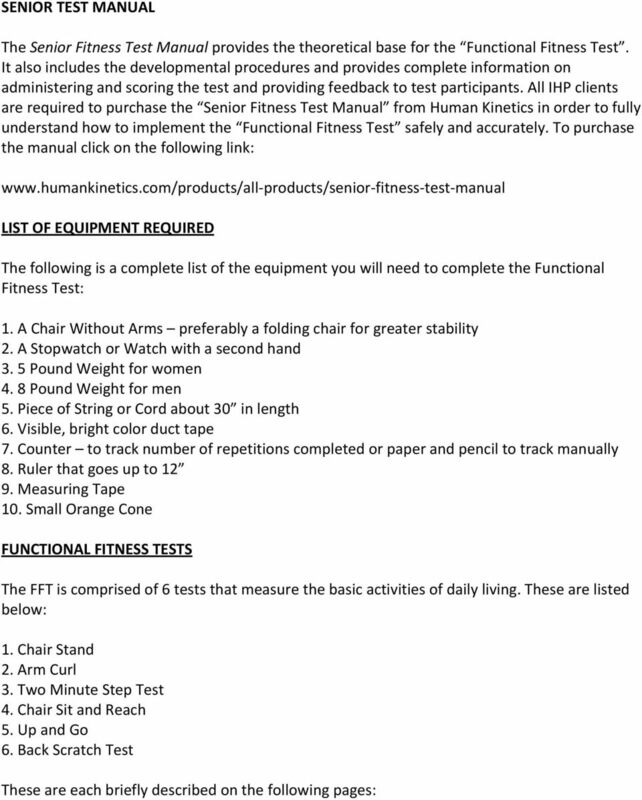 The Functional Fitness Test formally called the Senior Fitness Test is an answer to the need for a simple, easy to use battery of test items assessing the functional fitness of older adults. The test is safe and enjoyable, it meets scientific standards for reliability and validity, and it has accompanying performance norms from actual performance scores of over 7,000 men and women between the ages of 60 and 94. ABOUT THE AUTHORS: Dr. Roberta Rikli, Dean of the College of Health and Human Development at California State University, Fullerton, has received national and international recognition for her research on promoting health and functional performance across the lifespan. 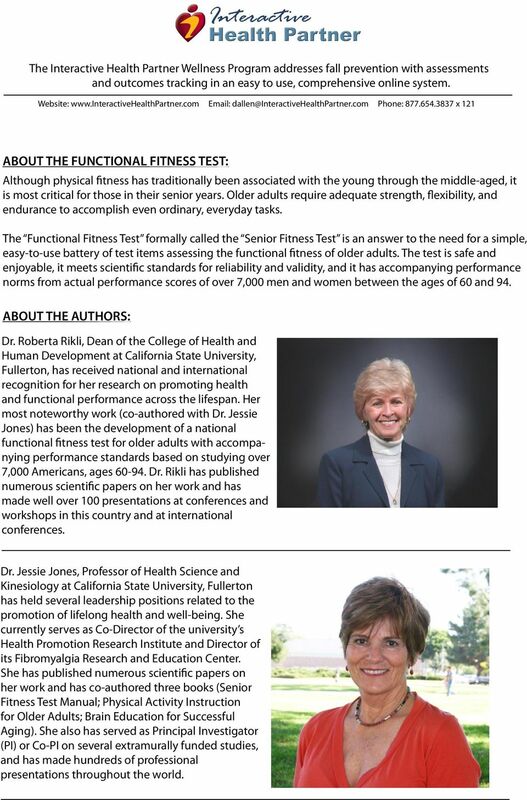 Her most noteworthy work (co authored with Dr. Jessie Jones) has been the development of a national functional fitness test for older adults with accompanying performance standards based on studying over 7,000 Americans, ages Dr. Rikli has published numerous scientific papers on her work and has made well over 100 presentations at conferences and workshops in this country and at international conferences. Dr. Jessie Jones, Professor of Health Science and Kinesiology at California State University, Fullerton has held several leadership positions related to the promotion of lifelong health and well being. She currently serves as Co Director of the university s Health Promotion Research Institute and Director of its Fibromyalgia Research and Education Center. She has published numerous scientific papers on her work and has co authored three books (Senior Fitness Test Manual; Physical Activity Instruction for Older Adults; Brain Education for Successful Aging). She also has served as Principal Investigator (PI) or Co PI on several extramurally funded studies, and has made hundreds of professional presentations throughout the world.!!! 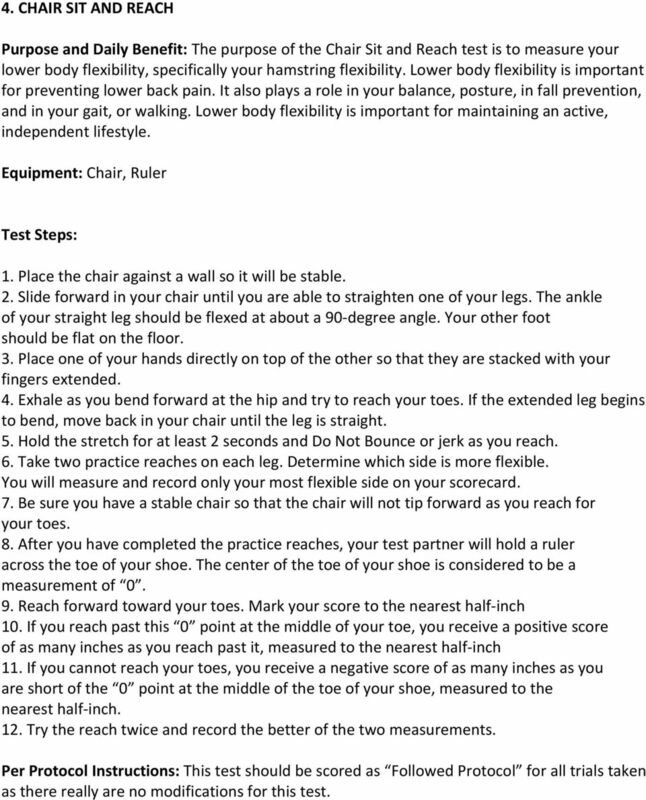 3 Individual Test Descriptions CHAIR STAND Purpose and Daily Benefit: The purpose of the Chair Stand is to measure the strength of your lower body. Lower body strength 1. is important for activities such as getting out of a chair, on the bus, out of the car, and rising up from a kneeling position in the house or garden. The strength of your lower body can directly affect the ease with which you perform the activities you do every day. Equipment: Chair without arms, Stopwatch 1. Place the chair against a wall where it will be stable. 2. Sit in the middle of the chair with your feet flat on the floor, shoulder width apart, back straight. 3. Cross your arms at the wrist and place them against your chest. 4. The test partner will tell you when to begin and will time you for 30 seconds, using the stopwatch. You will rise up to a full stand and sit again as many times as you can during the 30 second interval. a. Each time you stand during the test be sure you come to a full stand. b. When you sit, make sure you sit all the way down. Do not just touch your backside to the chair. You must fully sit between each stand. c. Do not push off your thighs, or off the seat of the chair with your hands to help you stand unless you have to. d. Keep your arms against your chest crossed and do not allow the arms to swing up as you rise. e. If you are on your way up to stand when time is called you will be given credit for that stand. 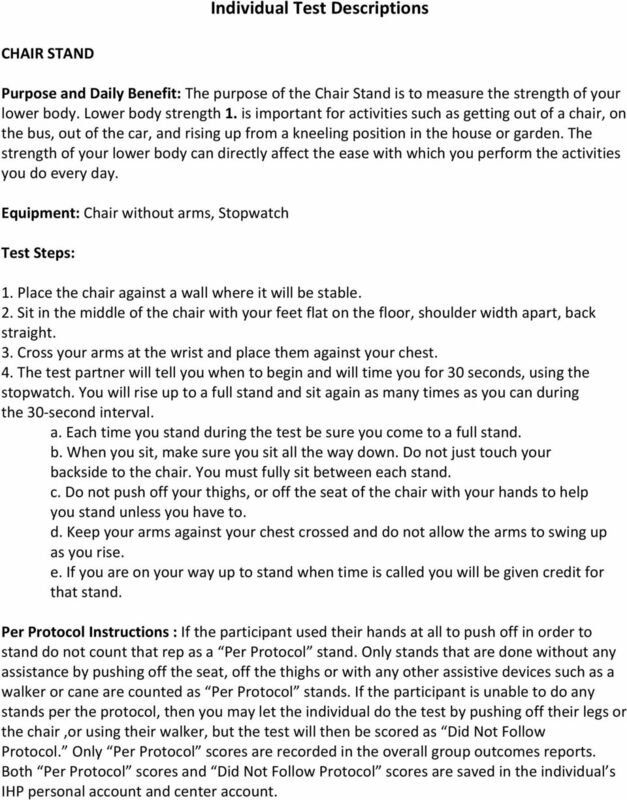 Per Protocol Instructions : If the participant used their hands at all to push off in order to stand do not count that rep as a Per Protocol stand. Only stands that are done without any assistance by pushing off the seat, off the thighs or with any other assistive devices such as a walker or cane are counted as Per Protocol stands. 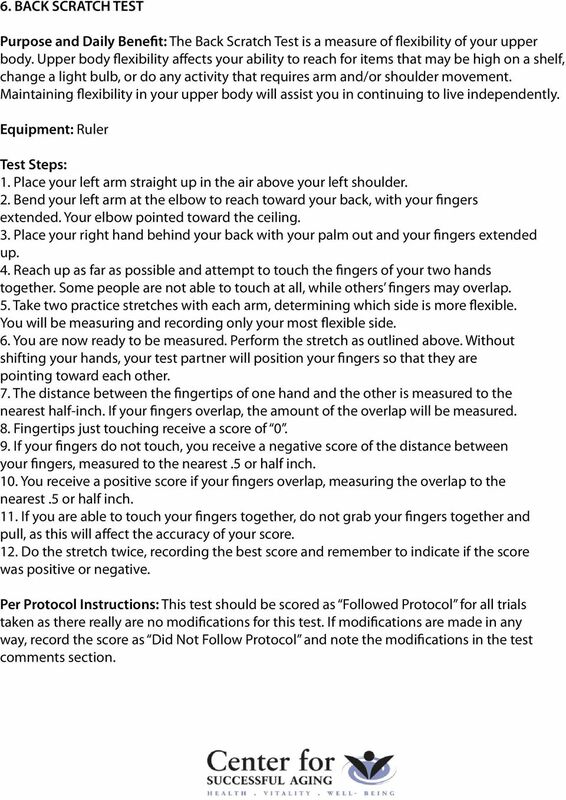 If the participant is unable to do any stands per the protocol, then you may let the individual do the test by pushing off their legs or the chair,or using their walker, but the test will then be scored as Did Not Follow Protocol. Only Per Protocol scores are recorded in the overall group outcomes reports. Both Per Protocol scores and Did Not Follow Protocol scores are saved in the individual s IHP personal account and center account. 4 2. ARM CURL Purpose and Daily Benefit: The purpose of the Arm Curl is to measure the strength of your upper body. Upper body strength is important for activities such as carrying laundry, groceries, and luggage. It is also important for picking up grandchildren and giving them a big hug! A lack of upper body strength could keep you from pouring milk from a jug, being able to go grocery shopping for yourself and maintaining your independence. Equipment: 5 lb Weight and an 8 lb weight, stopwatch and a straight back chair with no arms. Women will curl a 5 lb. weight in this test and Men will curl an 8 lb. weight for their test. It is extremely important to the accuracy of the test that you use the appropriate weight for men and women in this test. 1. Your test partner will tell you when to begin and will time you for 30 seconds, using the stopwatch or a watch with a second hand. 2. Do as many curls as you can in the allotted 30 second time period, moving in a controlled manner. 3. Remember to do a Full Curl, squeezing your lower arm against your upper arm at the top of each curl and returning to a straight arm each time. Keep your upper arm still. Do Not swing the weight. 4. If you have started raising the weight again and are over halfway up when time is called, you may count that curl! 5. Record the score on the scorecard. Per Protocol Instructions: Demonstrate the test slowly and insure proper grip. Allow participant to practice 1 2 repetitions. If the participant cannot lift the appropriate weight for their gender then the participant may do the test without a weight, raising just the weight of their arm. 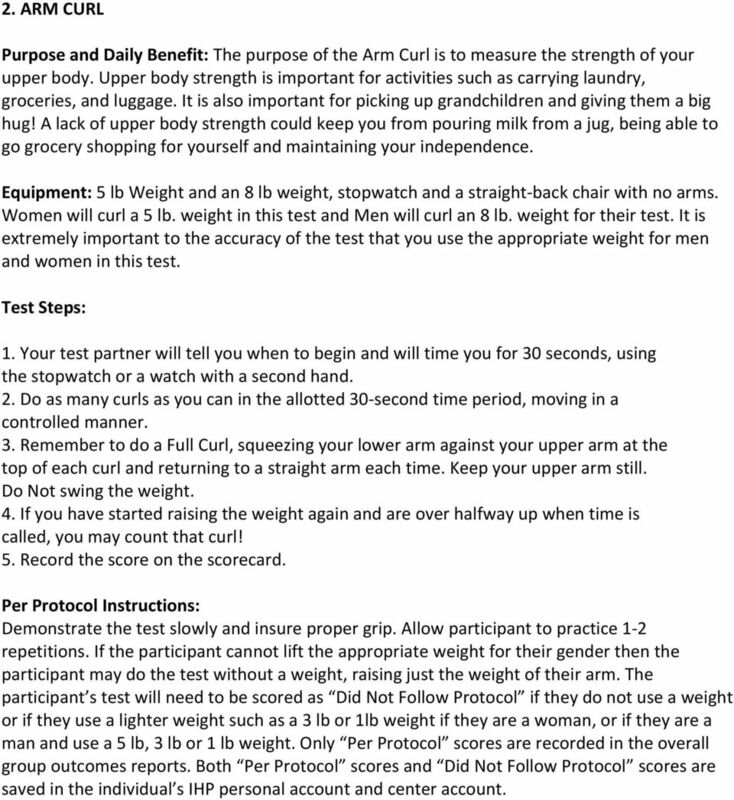 The participant s test will need to be scored as Did Not Follow Protocol if they do not use a weight or if they use a lighter weight such as a 3 lb or 1lb weight if they are a woman, or if they are a man and use a 5 lb, 3 lb or 1 lb weight. Only Per Protocol scores are recorded in the overall group outcomes reports. Both Per Protocol scores and Did Not Follow Protocol scores are saved in the individual s IHP personal account and center account. 5 3. TWO MINUTE STEP TEST Purpose and Daily Benefit: The purpose of the Two Minute Step Test is to measure your endurance or physical stamina. Endurance is important for activities such as shopping, walking for a distance, and traveling. The more physical stamina you have, the more energy you will have to do the things you enjoy. You will also be able to do more with less fatigue. Your endurance affects your ability to perform many of your daily activities and to maintain your independence. Equipment: Stop Watch, Measuring Tape, Visible Tape (i.e. 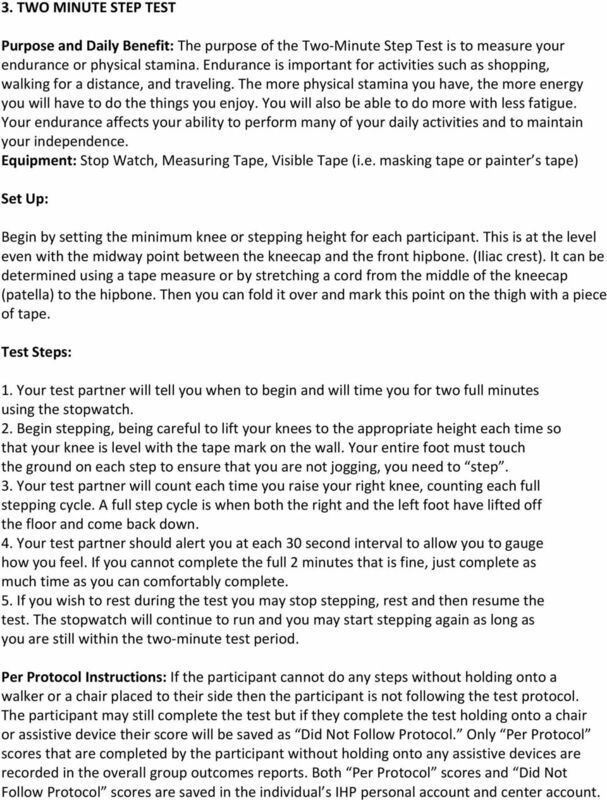 masking tape or painter s tape) Set Up: Begin by setting the minimum knee or stepping height for each participant. This is at the level even with the midway point between the kneecap and the front hipbone. (Iliac crest). It can be determined using a tape measure or by stretching a cord from the middle of the kneecap (patella) to the hipbone. Then you can fold it over and mark this point on the thigh with a piece of tape. 1. Your test partner will tell you when to begin and will time you for two full minutes using the stopwatch. 2. Begin stepping, being careful to lift your knees to the appropriate height each time so that your knee is level with the tape mark on the wall. Your entire foot must touch the ground on each step to ensure that you are not jogging, you need to step. 3. Your test partner will count each time you raise your right knee, counting each full stepping cycle. A full step cycle is when both the right and the left foot have lifted off the floor and come back down. 4. Your test partner should alert you at each 30 second interval to allow you to gauge how you feel. If you cannot complete the full 2 minutes that is fine, just complete as much time as you can comfortably complete. 5. If you wish to rest during the test you may stop stepping, rest and then resume the test. The stopwatch will continue to run and you may start stepping again as long as you are still within the two minute test period. 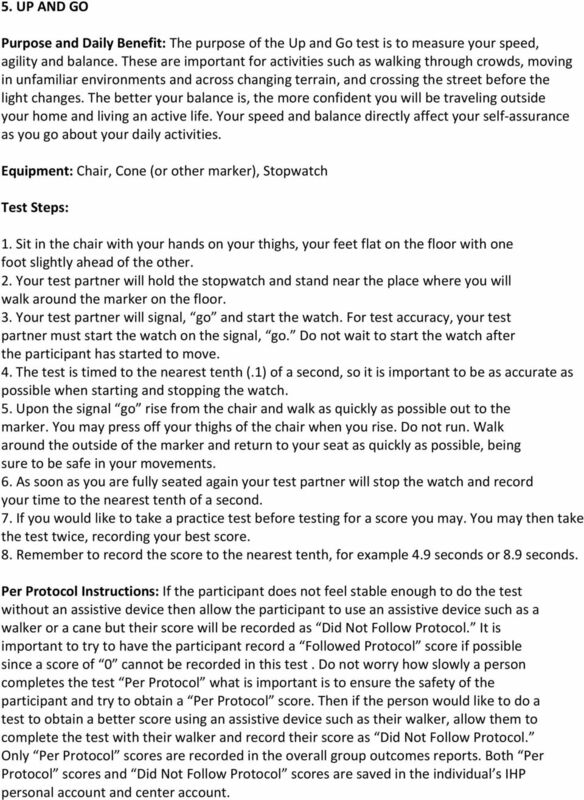 Per Protocol Instructions: If the participant cannot do any steps without holding onto a walker or a chair placed to their side then the participant is not following the test protocol. The participant may still complete the test but if they complete the test holding onto a chair or assistive device their score will be saved as Did Not Follow Protocol. Only Per Protocol scores that are completed by the participant without holding onto any assistive devices are recorded in the overall group outcomes reports. Both Per Protocol scores and Did Not Follow Protocol scores are saved in the individual s IHP personal account and center account. 6 4. CHAIR SIT AND REACH Purpose and Daily Benefit: The purpose of the Chair Sit and Reach test is to measure your lower body flexibility, specifically your hamstring flexibility. Lower body flexibility is important for preventing lower back pain. It also plays a role in your balance, posture, in fall prevention, and in your gait, or walking. Lower body flexibility is important for maintaining an active, independent lifestyle. Equipment: Chair, Ruler 1. Place the chair against a wall so it will be stable. 2. Slide forward in your chair until you are able to straighten one of your legs. The ankle of your straight leg should be flexed at about a 90 degree angle. Your other foot should be flat on the floor. 3. Place one of your hands directly on top of the other so that they are stacked with your fingers extended. 4. Exhale as you bend forward at the hip and try to reach your toes. If the extended leg begins to bend, move back in your chair until the leg is straight. 5. Hold the stretch for at least 2 seconds and Do Not Bounce or jerk as you reach. 6. Take two practice reaches on each leg. Determine which side is more flexible. You will measure and record only your most flexible side on your scorecard. 7. Be sure you have a stable chair so that the chair will not tip forward as you reach for your toes. 8. After you have completed the practice reaches, your test partner will hold a ruler across the toe of your shoe. The center of the toe of your shoe is considered to be a measurement of Reach forward toward your toes. Mark your score to the nearest half inch 10. If you reach past this 0 point at the middle of your toe, you receive a positive score of as many inches as you reach past it, measured to the nearest half inch 11. If you cannot reach your toes, you receive a negative score of as many inches as you are short of the 0 point at the middle of the toe of your shoe, measured to the nearest half inch. 12. Try the reach twice and record the better of the two measurements. Per Protocol Instructions: This test should be scored as Followed Protocol for all trials taken as there really are no modifications for this test. 7 5. UP AND GO Purpose and Daily Benefit: The purpose of the Up and Go test is to measure your speed, agility and balance. These are important for activities such as walking through crowds, moving in unfamiliar environments and across changing terrain, and crossing the street before the light changes. The better your balance is, the more confident you will be traveling outside your home and living an active life. Your speed and balance directly affect your self assurance as you go about your daily activities. Equipment: Chair, Cone (or other marker), Stopwatch 1. Sit in the chair with your hands on your thighs, your feet flat on the floor with one foot slightly ahead of the other. 2. Your test partner will hold the stopwatch and stand near the place where you will walk around the marker on the floor. 3. Your test partner will signal, go and start the watch. For test accuracy, your test partner must start the watch on the signal, go. Do not wait to start the watch after the participant has started to move. 4. The test is timed to the nearest tenth (.1) of a second, so it is important to be as accurate as possible when starting and stopping the watch. 5. Upon the signal go rise from the chair and walk as quickly as possible out to the marker. You may press off your thighs of the chair when you rise. Do not run. Walk around the outside of the marker and return to your seat as quickly as possible, being sure to be safe in your movements. 6. As soon as you are fully seated again your test partner will stop the watch and record your time to the nearest tenth of a second. 7. If you would like to take a practice test before testing for a score you may. You may then take the test twice, recording your best score. 8. Remember to record the score to the nearest tenth, for example 4.9 seconds or 8.9 seconds. Per Protocol Instructions: If the participant does not feel stable enough to do the test without an assistive device then allow the participant to use an assistive device such as a walker or a cane but their score will be recorded as Did Not Follow Protocol. It is important to try to have the participant record a Followed Protocol score if possible since a score of 0 cannot be recorded in this test. Do not worry how slowly a person completes the test Per Protocol what is important is to ensure the safety of the participant and try to obtain a Per Protocol score. Then if the person would like to do a test to obtain a better score using an assistive device such as their walker, allow them to complete the test with their walker and record their score as Did Not Follow Protocol. Only Per Protocol scores are recorded in the overall group outcomes reports. Both Per Protocol scores and Did Not Follow Protocol scores are saved in the individual s IHP personal account and center account. 8 6. BACK SCRATCH TEST Purpose and Daily Benefit: The Back Scratch Test is a measure of flexibility of your upper body. Upper body flexibility affects your ability to reach for items that may be high on a shelf, change a light bulb, or do any activity that requires arm and/or shoulder movement. Maintaining flexibility in your upper body will assist you in continuing to live independently. Equipment: Ruler 1. Place your left arm straight up in the air above your left shoulder. 2. Bend your left arm at the elbow to reach toward your back, with your fingers extended. Your elbow pointed toward the ceiling. 3. Place your right hand behind your back with your palm out and your fingers extended up. 4. Reach up as far as possible and attempt to touch the fingers of your two hands together. Some people are not able to touch at all, while others fingers may overlap. 5. Take two practice stretches with each arm, determining which side is more flexible. You will be measuring and recording only your most flexible side. 6. You are now ready to be measured. Perform the stretch as outlined above. Without shifting your hands, your test partner will position your fingers so that they are pointing toward each other. 7. The distance between the fingertips of one hand and the other is measured to the nearest half inch. If your fingers overlap, the amount of the overlap will be measured. 8. Fingertips just touching receive a score of If your fingers do not touch, you receive a negative score of the distance between your fingers, measured to the nearest.5 or half inch. 10. You receive a positive score if your fingers overlap, measuring the overlap to the nearest.5 or half inch. 11. If you are able to touch your fingers together, do not grab your fingers together and pull, as this will affect the accuracy of your score. 12. Do the stretch twice, recording the best score and remember to indicate if the score was positive or negative. Per Protocol Instructions: This test should be scored as Followed Protocol for all trials taken as there really are no modifications for this test. If modifications are made in any way, record the score as Did Not Follow Protocol and note the modifications in the test comments section.